Following the events of Ghost Protocol, Ethan and team take on their most impossible mission yet, eradicating the Syndicate – an International rogue organization as highly skilled as they are, committed to destroying the IMF. I’m not sure what’s more amazing; the fact that there’s a fifth Mission: Impossible film with Tom Cruise still in the lead, or that it’s possibly the best one yet. It’s also hard to believe that it’s been 19 years since the popular television series made a successful (albeit bumpy) transition to the big screen with Brian De Palma’s 1996 action flick, Mission: Impossible. I say “bumpy” because although it was a hit, it was largely criticized for being too confusing (and this was before any of M. Night Shyamalan’s twisty thrillers debuted) and for making the hero from the television series the film’s main villain. The movie introduced a brand new character into the fold, a young agent named Ethan Hunt. Cruise stepped into the shoes as Hunt, replacing Mr. Phelps as the hero and leading the charge for a brand new breed of IMF agents. And with the release of its first theatrical sequel in 2000, which was helmed by trendy action director John Woo, Cruise went on record as saying he wanted each Mission film to kind of stand on its own and be led by a different director. Sadly, the end result was distinctly disjointed, and to this day, Mission: Impossible II is the weakest in the bunch. Continuing on here with a little big screen Mission history, JJ Abrams took over the franchise, revitalizing it in 2006 with Mission: Impossible III before handing it over (but keeping it under his production company’s Bad Robot banner) in 2011 to The Incredibles director Brad Bird for Mission: Impossible – Ghost Protocol. Now, in 2015, Jack Reacher director Christopher McQuarrie (who previously directed Cruise in that film) takes a stab at the franchise with Mission: Impossible – Rogue Nation, making this film complete what feels like somewhat of a trilogy that started with M:I III and ends with Rogue Nation. In recent years, Cruise–even after having now entered his fifties–has been ramping up his stunts and risk-taking for the sake of real good cinema. He’s taken the viewpoint of the (jaded) moviegoer and decided to give them a thrilling good time. And what kind of makes him America’s Jackie Chan, when it comes to insane stunts, has put the actor in a position to just keep one-upping himself with each film. In Ghost Protocol, Cruise actually hung by a wire outside the tallest building on the planet. In Rogue Nation, he actually clung to the side of a giant aircraft as it took off (while being held on by a wire, but still!). The man’s a machine! But his dedication to these films and their audiences is what makes his movies so entertaining. Recent entries like Oblivion (2013), Edge of Tomorrow (2014) and now Rogue Nation are arguably better movies because of his intensity. 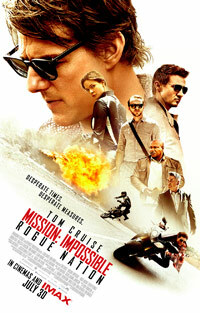 Rogue Nation is certainly a contender for the best in the Mission series. I rewatched all four previous films earlier in the week in preparation for watching Rogue Nation and it made for a far more thrilling investment in the film. To start, let me clear up one nerdy concern; I firmly believe that the music in a film is incredibly important to the film’s tone and the viewing experience. I thoroughly enjoyed Michael Giacchino (LOST, Jurassic World)’s scores for M:I III and Ghost Protocol and I was pretty concerned that Joe Kraemer, a name I was unfamiliar with, was taking it over. (It’s kind of like how Thomas Newman’s Bond entry for Skyfall lacked immensely compared to David Arnold’s previous entries.) Thankfully, Kraemer largely continues Giacchino’s style and feel for this score. Danny Elfman had scored the original while Hans Zimmer had given the sequel a more modern and hip feel. But Giacchino brought to the franchise this exciting, theatrical and classic sound, working in the original TV series’ theme and returning cues from the very first Elfman score. Kraemer actually carries Giacchino’s torch, and cues from at least four of these films thread through the entirety of Rogue Nation. I couldn’t help but grin several times just because of Kraemer’s musical direction. Mission: Impossible III introduced Simon Pegg’s comedic techie character, Benji Dunn, and Ghost Protocol promoted Benji to the field alongside Cruise’s Hunt. 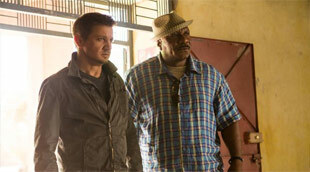 Protocol then introduced Jeremy Renner’s William Brandt into the fold. Brandt returns as well (although in a surprisingly minimized capacity), alongside Ving Rhames’ Luther Stickell who’s been in the picture since the first film back in 1996. Plot elements from Rogue Nation actually reference Hunt’s rogue mission in that film and this movie’s core story picks up right where Ghost Protocol left off. The anti-IMF organization, The Syndicate, in this film, is actually mentioned in the final few seconds of Ghost Protocol (and apparently also featured in the original TV show), while the drama surrounding the IMF this time around is a direct result of the team’s mission in that film, making Rogue Nation the first direct sequel in the entire series… and it’s awesome. I have to admit that much of my enthusiasm for Rogue Nation is rooted in nostalgia and my enjoyment of the series. But also, Cruise’s Hunt is just a really cool heroic figure. While M:I II was far cornier and goofier than any of the other films, he’s less the suave Connery-style Bond that they tried to make him in that film and more like a get-the-job-done-no-matter-the-cost kind of agent who isn’t afraid to lay it all on the line and risk his own life time and time again to keep his country and its residents safe. Rogue Nation does find Ethan to be an enemy of the state yet again, which is a tired idea, but it actually kind of fits in with the story–especially given the events of Ghost Protocol. In the same way that Hydra is a foil for SHIELD in the Marvel movies, The Syndicate is a foil for the IMF, and with their Secretary’s death in Ghost Protocol, it leaves the IMF team (who had all been disavowed due to a horrible frame-up that destroyed the Kremlin) out in the wind without much to defend themselves beyond their own word on what had happened. Pegg and Cruise are great together once again, and Hercules‘ Rebecca Ferguson joins the cast as Ilsa, who the audience (and the remaining IMF gang) spends most of the film questioning whose side she’s really on. Sean Harris enters the franchise as well as a perfectly creepy and ruthless villain. He’s sort of the Moriarity to Hunt’s Holmes. Many of the action sequences are just plain fun as well. From the opening sequence where Cruise clings to the side of the jet, to a nailbiting motorcycle chase (which is far better than the one in M:I II) and an underwater heist that’ll leave you gasping for air, there’s plenty of entertainment here. Just two moments out of the “impossible” action had me wonder why they hadn’t rethought them, and both felt a little bit like “nuking the fridge” (from Indiana Jones and the Crystal Skull). Both are instances where CG helps the action soar over the top; the first with Hunt’s body being thrown around violently inside of an airplane and the second when a car flips like a coin across a parking lot. They’re kind of played for laughs, but the cartoony-ness of the visuals didn’t quite fit the feel of the movie otherwise. The content is pretty in-line with the previous sequels. There are a couple uses of the “S” word, but not many, and a couple uses of blasphemy as exclamations (but thankfully infrequent. I think most, if not all, of it was uttered by Pegg). There’s no real sexual content, but Ferguson’s role as Ilsa is played up as a bit sensual. She shows leg in an elegant dress while aiming to take a shot with a rifle, a good deal of her figure is shown in a two-piece bikini, and her bare back (and parts of the side of her chest) are briefly seen when she’s removing her shirt while changing. The latter was surprising, but there aren’t any sexual situations otherwise. The violence is throughout, with some brutal beatings (like while Hunt is chained up and taking punches to his ribs), a young character being shot in the head off screen while Hunt is forced to watch, a rough knife fight breaks out between two characters, a main character briefly dies but is revived, and other hand-to-hand fights and scuffles. It’s heavy on the action moments, in line with the Bond and Bourne films. Overall, as a fan of the franchise, I loved Mission: Impossible – Rogue Nation. It’s still surprising that they are five films in and the series is still going strong. Who knows if there will be an MI: 6 (shouldn’t Bond be in it if there is? Ha! ), but if Cruise and company are up for it, I’ll be in the seat opening night. Rogue Nation is a solid spy action film. Alcohol/Drugs: There may be some miscellaneous drinking in the film, but nothing’s really focused on. Blood/Gore: Ethan moves his hand where he’s holding cloth against his bare stomach and we see a lot of blood on his hand from an unseen wound; Ilsa has an abrasion on her head after a fight; There’s a little blood on a man’s clothing and arm after he’s shot there; Ilsa has scrapes and brusies on her forehead and arms after rolling out of a car while it’s moving; Ethan and Ilsa have some cuts on their face during the film’s climactic fights. Violence: Hunt clings to the side of a plane as it takes off. When the door eventually opens and he is thrown inside and his body bounces across the plane cargo hold’s floor and into the side wall; A man holds a young girl at gunpoint while Ethan is trapped inside a booth that’s being gassed. He angrily bangs on the glass windows but the villain shoots the girl in the head (off screen). Hunt passes out after banging on the glass more; We see Hunt chained to pole with no shirt on when some men and a woman come in to interrogate him. A man called the Bone Doctor pulls out all kinds of sharp tools and punches Hunt in the ribs several times. He and the woman end up fighting everyone in the room until Hunt escapes. He’s shot at in the process and we later find out he was wounded; A SWAT team crashes into a room to seize Hunt but he’s not in that room; We see an assassination attempt on a Chancellor’s life. During this, Ethan fights a man with a knife and then combats two people with guns. Benji fights with a man with a gun who is then shot, so Benji ducks out of sight; A man is shot in the arm and taken away into a car which we see explode, killing everyone inside; Ilsa throws herself from a moving car; A man drowns and needs to be revived; A woman shocks a man who’s awake with electric paddles to knock them out; A big car chases ensues where Benji and Ethan use the car to knock out motorcyclists. Some drivers fly from their bikes and their bikes explode; A car flies backwards through the air and flips multiple times on the ground before landing upside down in a heap. A person proceeds to walk towards the car to shoot the men inside but a vehicle pulls up, hitting the attacker, presumably killing them (we just see their legs get hit by the truck); A man is shot with tranquilizers; A man is abducted and we later see them handcuffed to a chair and struggling; A man is strapped with explosives with their life threatened; There’s a big shootout at the end where Ethan shoots and kills many Syndicate bad guys; A knife fight happens between two characters with each slashing each other, but nothing is shown. It ends when one character jumps on the shoulders of the other and plunges their knife into the bad guy’s neck; A person is caught in a box and gassed as they shoot the glass panes around them; and other action violence.